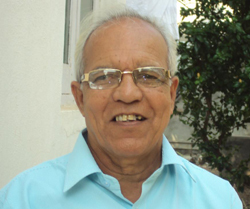 Govind Godbole, born on the 5th of March 1946, is a known name in the field of Marathi literature for children. He has done his MA, B.Ed and BJ and was a teacher for 9 years. After that he has worked for Akaashwani as a sub editor and then as a programme manager. His book series - Chocolate became popular, where he wrote small 16 page books each priced just a rupee. He has written 37 such books. He has also conducted many story-telling sessions and programmes for children. His published work includes more than 77 books in children's literature, education etc. He has also recieved many awards for his books in children's literature.